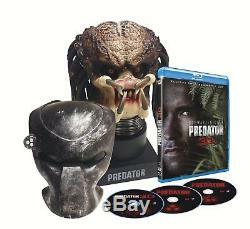 Blu ray 3d / 2d + dvd: predator. Cult movie for an incredible box, price 199 euros! The head will have the most beautiful effect in the living room, we can put or not the mask following the guests who arrive! Notes regarding payments For a transfer, ask me the coordinates. Notes regarding shipments for immediate purchases. The shipment is made the same day or the day after your payment in a bubble envelope. I am not responsible for postal losses, if you want a secure shipment, just tell me and count 2 euros more per disk purchased (max to pay to secure: 6 euros). Check out my other items. The item "box collector head predator + blu ray 3d + 2d nine arnold schwarzenegger" is on sale since Friday, February 23, 2018. It is in the category "dvd, cinema \ dvd, blu-ray".